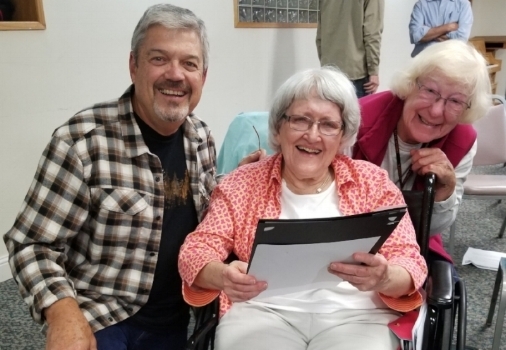 The Multnomah chapter recently awarded OMGA Certificates of Recognition for 20 years of Exceptional Service to Effa Rowley, Bob Dueltgen and Barbara Beck. Thank you all for your dedication and service- you are inspiring role models for us all! Additional awards will be presented at the upcoming October chapter meeting. Effa rowley receiving her certificate of recogntion for 20 years of exceptional service- congrATULATIONS EFFA! Effa Rowley has been a dedicated Master Gardener for 20 years! She has great garden knowledge and excellent research skills. Effa has supported the MG program as an educator at the phones, farmers’ markets and Rose Garden. Additionally, Effa was a class coordinator during training sessions and served as a mentor to trainees. She has an uncanny way of reading people and determining how best to assist them while helping them feel confident. Effa has supported the chapter by assisting in many projects. She was a long time member of the hospitality committee not only insuring we had good stuff to eat and drink, but also made everyone feel welcomed and valued. She participated in work parties. She was one of the founding gardeners of the demonstration garden and was faithful gardener for several years. She was one of the first to say, “I’ll do it”! Effa is truly a role model for us all. Thank you Effa! Bob Dueltgen receiving hIS certificate of recogntion for 20 years of exceptional service- congrATULATIONS BOB!! Bob Dueltgen has been a dedicated OSU MG with extensive volunteer time educating the public at multiple MG clinics, along with his wife Ann. Bob & Ann served at the Hollywood Farmers Market, Home & Garden Show, Yard Garden & Patio Show, Oregon State Fair, Portland Nursery Apple Tasting to name just a few. Bob has taught MGs valuable lessons in proper care and pruning of cane berries. Bob has taught many Noon-time Chats for MG Training, as well as seminars for the Multnomah County Chapter at the Demo Garden. Bob has generously assisted the Chapter Board with fine-tuning the Chapter Bylaws. Plus, it was Bob who assisted with the purchase of the Chapter’s very first laptop computer! All of his contributions throughout the years are greatly appreciated. Thanks Bob! Barbara Beck became a Master Gardener in 1998. She loves gardening and over the years has strongly supported and participated in the chapter’s educational activities and fund raising, such as the seminar-fund raisers that our chapter held for many years. Also, she enjoyed helping to teach our horticulture/science lessons to the hospitalized children with our Doernbecher Project. As a PGE employee Barbara guided financial grants to Master Gardener educational programs. She even made personal donations to our chapter Demo Garden. We can’t forget her contributions at the chapter board meeting over the years, as well. Barbara, you are a very generous and thoughtful person. We appreciate all that you have shared with us! Thank you for everything! Speaking of recognition, Portland Parks Foundation recently announced the winners of the 2018 Parks Champion Awards. Our very own Ginger Edwards was recognized as a Park Champion for her outstanding efforts to support vital, inclusive parks across the city. Congratulations Ginger! The Foundation will make a grant of $1,500 on the recommendation of the honoree to a community organization that aligns with our goal: to create a thriving and accessible parks system for a healthy Portland. An advocate for North Portland parks and neighborhoods, Ginger has been especially active with Arbor Lodge Park. She organizes community groups and businesses to volunteer throughout the year, works as part of the tree team and for tree giveaways, and helped to fund and personally maintained an ADA accessible restroom at the park’s popular and inclusive Harper’s Playground. Ginger has reccomended a grant to support Arbor Lodge Neighborhood Association. "...it isn't so much about me as it is the project and all the volunteers. To me it is like the saying, "if you build it they will come"; if you do things for the right reasons, and share you goals, other like minded people will show up and join you. That is what has happened at Arbor Lodge Park and Harper's Playground. This shows that something close to me and important in our neighborhood, resonates with others outside of our neighborhood."